Boyds Mills Press, 9781590785546, 32pp. The wolfsnail hunts its prey: other snails. This true tale of horror begins in the leaf litter beside a quaint porch in Jackson, Mississippi. The wolfsnail is on the prowl. Big, strong, and fast (for a snail), the wolfsnail has a taste for meat. In some areas, it is called the cannibal snail. It has earned the name. Soon, the predator finds the slime trail of a smaller snail and follows the path toward its prey. When the chase ends and the dramatic feast is done, nothing remains of the smaller snail but an empty shell. 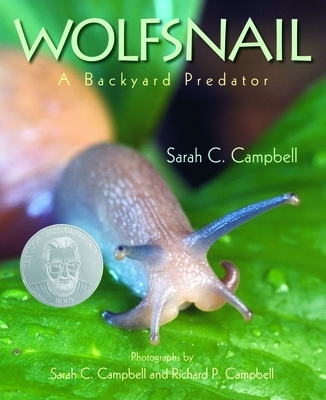 This photographic story, a Theodor Seuss Geisel Honor Book, of a day in the life of a wolfsnail offers a unique and dramatic introduction to the food chain. Young readers will be fascinated by this little-known predator and the impact it has had on habitats where it does not belong. Sarah Campbell is a writer and photographer with degrees in journalism from Northwestern University and years of journalism experience. She lives in Jackson, Mississippi, with her husband, Richard, and three sons. Richard Campbell is an executive vice president of a financial institution in Jackson, Mississippi. In his spare time, he is a partner in creative pursuits with his wife, Sarah, specializing in photography, design, and technology.